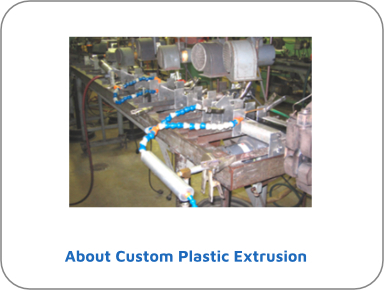 CUSTOM PLASTIC EXTRUSIONS OFFER COST-EFFECTIVE SOLUTIONS TO GIVE YOU A COMPETITIVE EDGE. Crafted Plastics Inc. partners with our customers to develop manufacturing advantages using custom plastic extrusions. By teaming up with our Extruded Plastic Specialists at Crafted Plastics Inc., customers have the opportunity to improve their effectiveness and performance in their manufacturing. 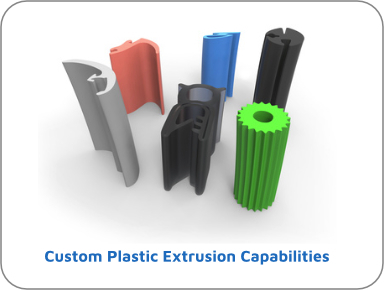 At Crafted Plastics Inc. cost-effective plastic extrusions outperform alternative components in a multitude of ways and diverse applications. Whether it is simple plastic tubing or a complex extruded profile, hundreds of manufacturers and distributors across the U.S. and World have found their solution at Crafted Plastics Inc.! Crafted Plastics Inc. gives our customers additional advantages. We design and build most of our tooling in-house. Our Engineering Staff and machine operators are familiar with most thermoplastic extrusion grade materials. 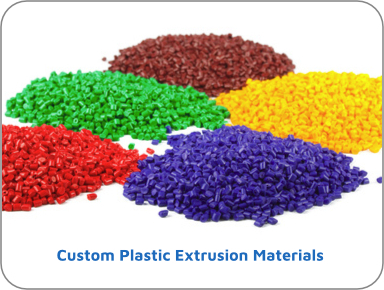 We can help our customers choose the best material for their extruded plastic application. Our Engineering Staff is also able to make tooling for the simplistic plastic profile / to co-extrusion / to the most sophisticated tri-extrusions. Crafted Plastics Inc. can produce custom colors that are matched to customer’s specific needs and requirements. Crafted Plastics Inc. can produce custom colors that are matched to customer’s specific needs and requirements. Crafted Plastics Inc. is also experienced in color matching plastic materials, including rigid PVC (polyvinyl chloride), polyurethane, ABS (acrylonitrile butadiene styrene), acrylic, styrene (high impact polystyrene), polycarbonate, polyethylene, PETG (polyethylene terephthalate glycol), polypropylene, flexible PVC, butyrate and thermoplastic elastomer. Our value added secondary operations, such as hot stamping, forming, notching, punching, piercing, drilling, and sawing fill the final niche capabilities many customers need to get a complete part from one source. Keeping overhead costs within your financial boundaries is not only good business, but good sense. Foot-by foot plastic extrusions usually cost less to produce than alternative methods.